Americans Who Tell the Truth is a website that celebrates passionate folks who give a damn about justice. This link takes you directly to the portraits page. 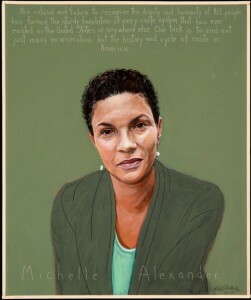 There you’ll find paintings of dozens of Americans who have impacted all of our lives in profound ways. Click on each Rob Shetterly portrait to find a short biography about an extraordinary person. The Americans who tell the truth project is “dedicated to the belief that a profound sense of citizenship is the only safeguard of democracy and the best defense of our social, economic, and environmental rights.” It offers resources for schools and other groups to engage with these heroes. While some are from the 19th century, others you may see on a news program tonight. You’ve likely read books by some or heard them speak. The remarkable thing: they’re all, like you and me, ordinary citizens who began to speak out and act on something they believed. As I have spent the past 10 years traveling around this country, talking about the people I’ve painted, about their ethics, history and citizenship, I’ve met an extraordinary number of good people. Engaged citizens in every state are determined to solve issues of inequality and injustice, pollution and poor education, money in the political system and corporate media failing to tell the truths citizens in a democracy need to know. The problems are big, but the number of people wanting them corrected is big, too. 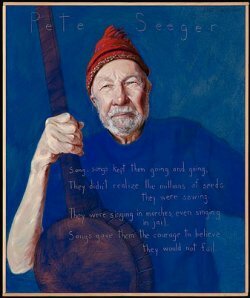 Pictured: truth tellers Pete Seeger and Michelle Alexander.